Greetings in the name of God and Jesus Christ. I bring you blessings, my dearest friends. Blessed is this hour. I heartily welcome a few new friends, and I want to say to them that this path will bring many solutions for every one of them—solutions they may have consciously as well as unconsciously sought for a long time. Most people with even a little spiritual knowledge know in a general way what this life is all about, what the reason is for this often painful existence on earth. You all know that life is to be considered a school. You go from one incarnation to the other as you go from one class to the next, making the grade or remaining where you are for a while, learning, developing, purifying. This is the explanation for all life on earth. But to know this is not in itself sufficient to solve your individual problems, my dear ones. You have to come to the point where you understand your own, individual existence; where you understand the origin of the difficulties, the sorrows, the longings, the unfulfillments of your life. And this you can find out if you learn to understand yourself. This is neither as easy nor as difficult as it may seem. When I say “to understand yourself,” I do not mean your outer deeds, decisions, and reactions. These you can often explain and rationalize, and therefore you believe that you know yourself. But is there any human being who is not forced into reactions and decisions by his or her own compulsive and unconscious trends? The particular path on which I lead you, my dear friends, will make you understand, step by step, how and where your outer problems are connected to your inner conflicts, where you react emotionally in a way that will attract certain happenings to you as inevitably as a magnet draws iron to itself. These forces can be truly understood only when you uncover your emotions and find out their deeper meaning. And with that knowledge you find the particular reason and purpose of your life, your own individual existence. When this is discovered, an entity has reached an important phase in his or her whole cycle of incarnations. That this knowledge can be brought forth is the result of important efforts, which in turn are a sign that a soul has reached a significant milestone on the upward road. At that point you step across the borderline between unconsciousness and consciousness with a higher degree of awareness. The true understanding of one’s present existence marks, indeed, a major stepping stone of a soul’s return journey to God. The subject chosen for tonight is the question of authority and what this concept implies for human beings. This is a much more important question than you now realize, my dear friends. Authority is the very first conflict for a growing child when it reaches a certain degree of consciousness. Elders, parents or parent-substitutes, and later on teachers represent authority for the child. This authority denies the child many a wish fulfillment. Therefore, authority seems hostile. No matter how much love, warmth and affection a child is given, no matter how necessary the prohibition is at times, it represents the first hurdle of life. The child’s attitude toward authority is carried over into adult life. The often unconscious reactions to authority indicate whether this hurdle has become a stepping stone toward maturity or not. If the grown person can adjust to authority maturely and freely, another milestone has been reached in the overall development of the soul. If, on the other hand, reaction toward authority remains childish because unconscious compulsive attitudes prevail, then this milestone remains to be reached later. As long as this point in development has not been reached, the imperfect soul would react negatively toward authority, even if it were administered in a perfect way. But since people are imperfect, authority too is often administered in a very imperfect way. Thus a barrier is set up between the child and the authority, the grown-up. It is worse if love is missing, or is not given in the way the child needs it. But even if love is there, the conflict still exists. On the one hand, the child longs for the love of the parent, on the other, it resists and rebels against being restricted by authority. The child feels the authority as a hostile force, an enemy that locks it behind prison bars where it feels frustrated. There is often but one impatient longing in the child: to become an adult so that what it erroneously believes to be restricting walls will cease to exist. But when the child grows up, authority merely changes: instead of parents and teachers, authority is now represented by society, government, law-enforcing institutions, an employer, or other powerful people he or she may be dependent upon. Unconsciously, your old feelings are carried over from childhood, and authority now restricts you as an adult. The same conflicts re-emerge in different ways: as a child you were torn between the desire to be loved and accepted, therefore to rebel against authority was impossible—or so you believed. As an adult you still suffer from the same basic conflict: on the one hand, openly rebelling against the restrictions; on the other, fearing the stigma of being ostracized, despised, of not belonging. This conflict can only be resolved if the unconscious emotions in this respect are recognized and translated into clear and concise thoughts and words. It will take time, but it is feasible. The usual solutions devised by the unconscious are often faulty. I will help you and give some pointers how to recognize your own particular way of reacting toward authority. Broadly speaking, you react to authority in one of two ways—all human beings do. There are two basic categories, with many subdivisions—and often the two groups intermingle and are represented in one and the same human being. At one time one reaction may be predominant, at another, the opposite extreme, or a variation of it, may predominate. It is then important to find out when one reaction is stronger and when the other, and why. You can and should retrace all this to childhood feelings and reactions to your early environment. Only then can you find the pattern-like later repetition of your early behavior and reactions, and only in that light will you be able to understand your present reactions. Let us examine these two basic categories separately for the moment. It will be easier this way, but please realize that only in rare cases will you find such a strong predominance of one trend in a person. There is always a mixture. First, let us look at those who rebel and revolt outwardly against authority. They feel authority as an enemy because many desires that were neither bad nor in any way harmful—in childhood as well as later—were forbidden by some authority. They know, or think, that there is nothing wrong with what they want. Yet, authority hinders them, and they often feel that the authority is not only unjust, but generally harmful, narrow-minded and unconstructive. Now, if the person happens to have an extroverted outgoing nature, combined with a certain courage, the rebellion will take a form in which he or she openly fights and resists. This can take place from its mildest form of personal and private attitudes, spanning the whole scale, up to overt social rebellion, through affiliation with minority parties, anarchist groups, or committing crime. The strongest form of this attitude will be found in the person who commits antisocial acts. The mildest form may not even be noticeable to others. Nevertheless, the same rebellious feelings do exist there, too, in subtle ways, in the subconscious. These produce in the person’s life just as tangible outer results as the openly rebellious reactions. In the other category are those who at one time have turned around, unconsciously thinking, “If I become one with the authority, much as I may dislike that authority, I am safe.” The belief in this apparent safety leads the extreme type in this category to become a strict law-upholder—not necessarily always overtly, but perhaps in more subtle ways. The law upholders, in order to safeguard their own position and to hide their own rebellion—which deep down is quite similar to the law-breakers’—will become extremely opposed to the law-breaker. The more afraid they are of their own tendencies of hidden rebellion against law and authority, the more will they find it necessary to become very severe with the law-breaker in whom they see a part of themselves which they do not want to expose. Exposing their true feelings was exactly what had seemed so risky and dangerous that they decided to join the “enemy camp.” The fear of their own exposure makes such people doubly “good.” Now, do not interpret the word “good” in its real sense. Put quotation marks around it. Yet I do not mean that such a law-upholder cannot be also a really good person—just as truly good as one with a tendency to hidden rebellion. Both react immaturely and ignorantly. The inner motivations of the law-upholder described here are rooted in weakness and fear. And an act or an attitude that comes from weakness and fear can never produce positive results. The fact that this attitude was adopted unconsciously and in ignorance does not alter the results. To achieve a positive outcome, a free, strong and independent choice has to be made. As I often say, a person’s unconscious affects the unconscious of another person infinitely more strongly than a consciously recognized attitude, act or motive. In other words, if you are driven into certain attitudes by your unrecognized fears, the effect will be infinitely stronger on other people than when you do the same act, have the same motives and attitudes, but recognize your own inner tendencies and currents. Thus, the law-upholder, motivated by the wrong protective measures he or she has chosen, has a particularly bad effect on the law-breaker. The latter feels quite differently and much less rebellious when he encounters a law-upholder who is governed by healthy, conscious and mature motivations based on strength, not weakness. Please, my friends, do not take the words “law-upholder” and “law-breaker” only in the crude and outer sense, referring to your social laws. Think about them also in the psychological sense, the sense in which I speak. The more hidden forces and reactions in the attitude of the law-upholder—even though he or she may consciously be in good faith—the more adverse will be the effect on the law-breaker. The true law, the divine law, is different from the weak and often doubly intolerant attitude of the law-upholder who has chosen that position out of fear and in order to become free of the disadvantages their own rebellion may have caused them. There are many shades and variations in both these opposite types. The law-breaking tendency must be combined with a current of courage. Otherwise, if certain other character traits and outer circumstances combine, their rebellion will be dimmed to a dull defiance. As far as the law-upholders are concerned, who lack the courage to give vent to their true feelings, their predominant qualities and faults are different. For instance, there may be a combination of a strong liking for order and organization and a wish for peace rather than for fighting, along with many other tendencies, which will then determine a person’s final attitude in this respect. I hope none of you will misunderstand me and conclude that the law-breaking stance is the desirable one, simply because the other wrong extreme is also imperfect. Such misunderstandings occur so often in your world and become responsible for many wrong views, philosophies and teachings. Whenever humanity finds out that an attitude or an opinion is wrong, it swings over to the opposite extreme, which is equally wrong. These two opposite extremes set a vicious circle in motion: the greater the rebellion on the part of the law-breaker, the more severe and intolerant the law-upholder becomes, in order to protect him- or herself from their own fear and rebellion. As a result, the rebellion and resistance in the law-breaker must become all the stronger. The law-breaker is unaware of the fact that his or her resistance is not turned against the law as such any longer, or against authority in its good and true sense, but actually against the false note in the equally unaware law-upholder. This is a very difficult subject because it is so very subtle in nature. Each one of you can find out quite easily to which of these two basic categories you predominantly belong, in what aspect of your life one or the other tendency may express itself more strongly. If you examine your life and your inner reactions in this respect, it will not be difficult to find out which. Once you can give yourself the answer, you can go a step further and think about the remedy. Also, consider the effect your attitude has had on your life, your conflicts, as well as on your surroundings, including some of your dear ones. If you find yourself to be more of the kind who revolts and rebels against authority, then you should meditate to gain the right concept. Strive for an awareness of the difference between real authority in the divine sense and the imperfect human authority you have often encountered in your life—since humankind is imperfect. See that unconsciously you are under the impression that authority means only the wrong kind. Once you can differentiate and recognize the two kinds—even though you may have seldom, or never, encountered the true one—your resistance against authority will automatically diminish. And after such recognition, you will not mind half as much the existence of the distorted and weak brother of the true authority and law that is your protection as much as anyone else’s. You will no longer feel that authority, as such, is an enemy force. The knowledge of all this will help you build the proper concept in yourself—and this will enable you to sense the wrong kind without minding it, because you will now understand the motivations and be able to sympathize. You will recognize that currents similar to your own prevail in the “enemy”—they just manifest differently. This process means raising one’s consciousness. You will then also recognize the necessity for law and order, and therefore for authority whose task it is to uphold it. The fact that the manifestation of the ideal principle cannot exist on earth yet will not confuse you any longer. The ideal, wise, good and understanding authority will remain a goal to be attained. You will understand that even the imperfect form of authority, as it manifests on earth, is necessary. In short, your rebellion will diminish to the extent you gain insight and understanding, to the extent you understand why you have reacted so adversely to certain subtle manifestations of the wrong kind of authority in the past. Furthermore, you will become increasingly aware of the meaning of divine authority that manifests also in some human beings who have reached a certain degree of development in this respect. You will then learn not to react automatically against anyone or anything just because you may feel that it represents authority. Unless you focus your attention on this whole problem, even if the right kind should happen to come your way, you would not be in a position to feel and perceive the difference, because your intuition is dulled by blind and rigid reaction and revolt. But when you think about it in this way, you may find that perhaps a few times in your life you have met someone who is very good and very wise and very kind, without being perfect in all ways, and who is, therefore, an authority—not necessarily on any particular subject, this is not what I mean at all—but a person of authority, as such. If you observe, in retrospect, the emanation coming from such a person, you will sense that the attitude of that person was different from the attitude of the law-upholder who is motivated by weakness and fear. As I said before, the vicious circle, when it goes on and on with a person who is not developed spiritually, may lead to criminal acts—and these have to be stopped, of course. How many criminals commit crimes not for the sake of the crime nor for the “advantages” the crime may bring. The deep, underlying root is rather the opposition to either the real or the imagined “goody-goodyness” of the law-upholder. When people are that far in this vicious circle, they can no longer recognize the true and right kind of authority, even if they should come across it. They will blindly react without inner discrimination, because they have no concept that a difference exists. That is why it is so important to gain the right concept by thinking this through. 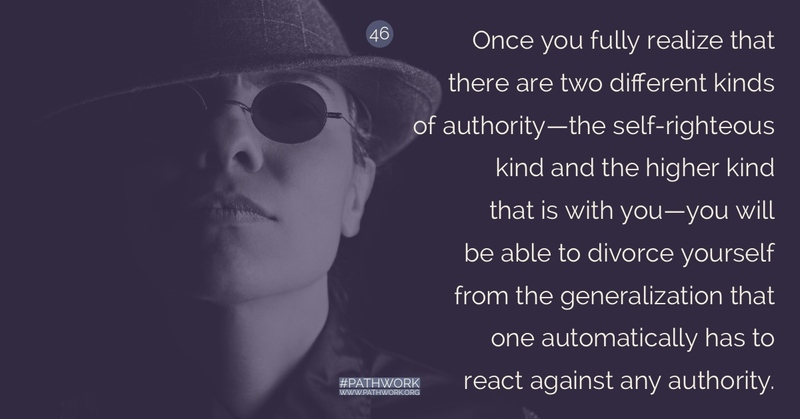 Once you fully realize that there are two different kinds of authority—the self-righteous kind and the higher kind that is with you—you will be able to divorce yourself from the generalization that one automatically has to react against any authority. This healthy reasoning process will, among other things, strengthen your power to discriminate in a very subtle way—not intellectually, but intuitively. Now, as far as the other category is concerned, if you find out that you tend to be more on the side of the law-upholder, my advice is this, my friends: think back to your childhood and find the times when you revolted. When you search with this aim, you will sooner or later discover and actually remember—perhaps only as a vague feeling, but nevertheless remember—just when you decided to turn around and become one with what appeared to you the stronger force, the authority as you perceived it. True, good motives are surely also contained in these inner decisions, but also weak ones. And it is your task to find the latter too, and become aware of them. When you come to this point, you will have made great progress on the road to self-understanding, on the way to becoming yourself. Then, when you seek further, you will also understand the reaction others have toward you. The self-righteous severity that sometimes takes hold of you—quite unconsciously and hidden—toward a brother or sister who strictly belongs to the other kind, will lessen. Your reaction will change in the measure you recognize the weak and fearful motives of your own law-upholding tendency. Thus you will make an act of strength out of an act of weakness. You will remain on the side of the law, of course, as you should—the outer, as well as the inner law—but with a different attitude, with a different flavor, with a different motive. That is the important thing. You will realize that just because you are on the side of authority, on the side of the law, you are doubly responsible in your obligation not to reject the side opposed to the law, but to pull the person out of his or her brand of error with your understanding. You can do this only if you understand yourself first and by sympathizing with the law-breaker—which does not mean to be in favor of the rebellion and of actions resulting from the rebellion. Why do you think that the man Jesus brought so much censure upon himself? Human authority censured him because he associated with the lowly, with common criminals and prostitutes. And all those lowly people felt this quality of understanding within him. Against Jesus they did not rebel, because they felt not only his true goodness, but also his understanding of the reasons why they were what they were. They felt he did not judge, they felt he went with them, in spite of the fact that he was, of course, opposed to their acts and wrong attitudes. He could even laugh with them, and also laugh at the wrong and pompous kind of authority that is so proud of its law and its letter. His is the kind of authority you should strive for, my friends. Go with the other person who revolts in some subtle way you may only sense—while you also, subtly and unknowingly reacted in the wrong way. This the other also sensed vaguely. Understand his attitude by understanding your own, laugh with him, build common ground with him. Do not set yourself up as a judge, although you may do so quite unconsciously. This balance is very, very subtle, my friends, and it has to be found and solved in your innermost soul. By no means does that imply that the law-breaker should go unpunished. That is not the point. When he becomes dangerous to the welfare of others, he has to learn a lesson. But if that happens, it is partly because the wrong kind of authority has prevailed too long, and has driven the law-breaker deeper into ignorance and darkness, instead of lifting him out of it. You see, my dear ones, all the miseries on this earth, the real problems such as criminality, war, injustices of any kind, disease, and other serious problems, are the result of faults of long standing. When we spirits are asked what is the remedy for this or that situation—be it general or personal—the answer cannot be given so easily. For a whole chain reaction has to be followed through, and often in an unpleasant way, until you get to the roots of the problem. All severe problems are due to some raging, vicious circle that has to be crystallized out and understood in order to find these roots. The final and last link of the whole chain reaction—the one that manifests outwardly, while the previous links are hidden from sight—has to be helped, certainly. But this treatment will always be a painful one, particularly if the inner root is not sought while the outer remedy is applied of necessity. So, for instance, war is certainly tragic, but it is in certain instances a last resort, that is even necessary, because humanity has neglected to look for the inner roots of the problems. So it is with everything else. Common criminals have to be prevented from continuing their deeds by law-enforcing institutions that are, perforce, themselves imperfect. Again, the solution has to be found earlier so that this final and drastic result of the chain reaction can be avoided. In all these vicious circles all are involved, not only the law-breaker, not only the apparent wrongdoer. In order to build a world in which vicious circles are prevented or broken before they come to the last and unfortunate outer manifestation, you can furnish the cornerstones by examining your own reactions and understanding in what way you have contributed or are contributing by your own unconscious emotional reactions to set an avalanche rolling. In this way, you and many others can help prevent the entire chain reaction. What I said to you here is of more significance and importance than you may realize offhand. I know that it is not only extremely difficult to squeeze these very subtle concepts into human language, but also that it will take quite a bit of effort and searching on your part to begin to understand the inner and deeper meaning, and to see the wider effect of this whole question. Are there any questions in connection with this subject? QUESTION: Isn’t the only person who is a real authority, in the final analysis, the one to whom God speaks? QUESTION: May I ask, is it necessarily so with everybody that one of the two trends is predominant? ANSWER: No. I said that in some cases there may be a fifty-fifty mixture, more or less. In most cases one is a little more dominant. In some cases one is really predominant. But in many cases there is a mixture. In these cases it will be very useful and interesting to find out when, at what opportunities, in what instances and situations, or with what types of people one trend is predominant and when the other. That will also furnish clues of utmost importance in your self-search. There will be patterns of behavior to recognize. QUESTION: Is there a special way to go about rectifying or balancing the extreme? QUESTION: Isn’t self-will the main hidden current in the case of the law-breaker and fear in the case of the law-upholder? ANSWER: Yes, this is certainly true. These would be the predominant factors in each case. And pride also plays a role, in both instances, only used in different ways. Now I will retire into my world again, but I will leave you, my dear ones, with a very strong blessing, with a heavenly light that shines upon each one of you. Do not despair when you are sad and discouraged, there is no reason. For life is eternal, and you are building your eternal abode in this your life, on the path you are so courageously taking. In that house you will be able to live in eternal happiness, without any woe, without any sorrow, without any parting, ever! So go in peace, my dear ones, be blessed in body, soul and spirit. Be in God!